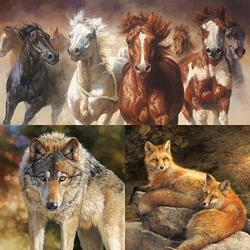 Bonnie Marris has published more fine art editions featuring the red fox than any of our other wildlife artist. The red fox was the subject of one of Bonnie’s early limited editions and coincidentally that winter scene of two fox was titled Courtship. This month, we celebrate 30 years of publishing Bonnie’s work with a new vulpes vulpes (red fox) courtship painting. Widely distributed across Eurasia, North Africa, South China and North America, red foxes hunt birds, insects and small animals, mainly weasels and mice. Red fox pairs mate for life, although they usually only live together during the winter months. The male red fox is referred to as a dog, while the female is known as a vixen and their offspring are “kits”.